The second Turner (DD-834) was laid down on 13 November 1944 at Bath Maine by the Bath Iron Works Corp.; launched on 8 April 1945; sponsored by Miss Louise Leahy granddaughter of Fleet Admiral William D. Leahy; and commissioned on 12 June 1945 at the Boston Navy Yard Comdr. Ellis B. Rittenhouse in command. Immediately following her commissioning Turner began undergoing conversion to destroyer picket ship at Boston while her crew attended intensive specialized schools in preparation for picket duty. In mid-July she arrived at Guantanamo Bay and while she was undergoing shakedown in Cuban waters Japan capitulated ending World War II. Late in August the ship returned to Boston for post shakedown availability. In the second week of September she resumed training exercises in the Caribbean and in Atlantic coastal waters. On 8 October she departed Norfolk and steamed via Pensacola the Panama Canal and San Diego to Hawaii arriving at Pearl Harbor on 28 November. There she prepared for duty in the Tokyo area and on 10 December departed the Hawaiian Islands and proceeded to Japan. She operated out of Japanese ports with Task Group 55.4 Task Force 54 and other elements of the 5th Fleet until 24 March 1946 when she departed Yokosuka and proceeded via Midway to Pearl Harbor. She remained at Oahu until 29 May when she got underway and proceeded to Roi Island. In June and July she participated in Operation "Crossroads" the atomic bomb tests at Bikini Atoll during which she was flagship of Destroyer Squadron 5 and supported air operations for Section Baker of the tests. She returned to Pearl Harbor on 30 July got underway again on 7 August and steamed into San Diego harbor on the 13th. The ship operated along the west coast until August 1947 mainly participating in hunter-killer and fleet exercises. After loading ammunition at San Pedro the destroyer in company with Destroyer Division 132 departed that port on 26 August 1947 steamed via the Hawaiian Islands and Japan; and arrived at Tsingtao on 20 September. She visited various China coast ports before her return to San Diego on 5 May 1948. For nearly a year she operated out of California ports conducting reserve training cruises and inter-type exercises. 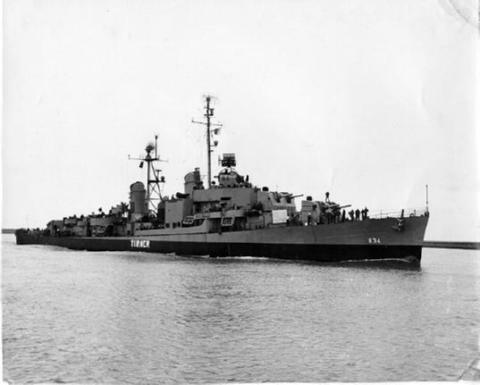 Turner was reclassified a radar picket destroyer on 18 March 1949. She departed San Diego on 4 April steamed via the Panama Canal and arrived at Newport R.I. on 21 April 1949. There she received additional electronic equipment enabling her to carry out her new duties. Throughout the 1950's she conducted reserve training cruises participated in fleet exercises and frequently made 6th Fleet deployments. On her eighth Mediterranean cruise in 1958 she acted as a picket ship for Task Force 61 during the Lebanon crisis. In 1959 she shifted homeport to Mayport Fla. and continued to pursue the same duties. At the New York Naval Shipyard in 1960 she underwent a Fleet Rehabilitation and Modernization (FRAM) overhaul which improved her radar and sonar capabilities in antiaircraft and antisubmarine warfare. In 1961 the Charleston Naval Shipyard installed a new variable depth sonar adding to Turner's submarine detection equipment. Into the 1960's she alternated frequent Mediterranean cruises with routine Atlantic training exercises Atlantic picket duty and special assignments. In 1962 she joined Task Force 140 the Project Mercury Recovery Force and in 1964 she added a Red Sea and Persian Gulf deployment to a Mediterranean voyage. In November and December of that year she remained on station in the Caribbean in support of the Gemini II space shot. Armed conflict flared in the Caribbean in April 1965 and from 8 through 25 May Turner operated with Task Force 128 in support of the American presence in the Dominican Republic. She again provided assistance to the American space program in February 1966 when she patrolled an alternate recovery station at a point midway between South America and Africa not far from the equator as a backup site for a project Apollo landing. While in the Caribbean on routine training in August 1967 Turner conducted a search for a disabled motor boat which had been adrift in the Windward Passage with 11 passengers on board. After a four-hour hunt she located and assisted the boat and its occupants. During her 14th Mediterranean deployment late in January 1968 she directed the fruitless search for the missing Israeli submarine Dakar; and while operating with Independence (CVA-62) in the Mediterranean in October of that year Turner rescued two survivors of a downed plane. Early in 1969 she completed her 15th Mediterranean deployment and returned to the United States. In April she arrived at Mayport and was decommissioned there on 26 September. Her name was struck from the Navy list that same day and on 13 October 1970 she was sold to Southern Scrap Material Ltd. New Orleans for scrapping.